If you recently purchased or own an older pop up tent trailer, pop up camper repair knowledge is a must. Pop up campers, also known as tent trailers, are small lightweight travel trailers that fold down while traveling and, through a system of cranks and pulleys, pop up when you are camping. Many things can break on a pop up trailer, especially if it is older. The following is a list of the most common problems you may encounter. Most pop up camper repair jobs you can do yourself, depending on your skill at repair jobs. Some repair jobs should be left to a professional such as replacing all the canvas or problems with the electrical or gas system. If the trailer was in an accident, a professional should do structural repairs. Measure the tear, hole, or rotted out area. Cut out a piece of canvas from the patching kit that is similar to the original color of canvas. Cut it one inch larger all the way around than the problem area. On the inside of the camper coat the area with canvas adhesive from the patching kit. Cover it with the piece of cutout canvas. Wait approximately 10 minutes until it dries. Cut another piece of canvas for the outside of the camper. Apply the adhesive and the canvas and wait 10 minutes till it dries. Keep the pop up camper erect for 24 hours so the repaired area will dry completely. Spray the patched area with a waterproof silicon spray or wax. Occasionally the canvas of the pop up camper may need to be waterproofed. Rub a waterproof wax or use a fabric waterproofing spray on the canvas. If the crank on your pop up stops working, the first step is to lubricate the crank and pulleys with grease. Use a lubricant, not a spray solvent like WD-40. Lubricating grease comes in spray bottles as well. Check the cables for breaks or slips off the track. You might need to replace a cable that is broken. If there is a tear in a window screen you can apply clear nail polish if the tear is small enough. If the tear is larger, purchase a screen repair kit from your home supply store. Check the tires regularly for wear and replace as needed. Lubricate the wheel bearing with heavy grease. Bring along a spare tire on long trips. If the linoleum is lifting or in disrepair in your pop up camper, you can easily replace it with new vinyl linoleum squares. Remove all of the old linoleum. Vacuum and sweep the base floor. Put down new peel and stick vinyl tiles. 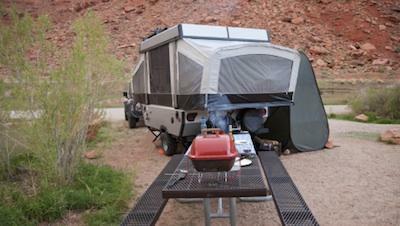 Repairing your pop camper by yourself will save you a lot of money and prolong the life of your trailer.